Karlsruhe, Germany, November 2, 2016 – EIZO GmbH today announced a new 49-inch wall mount monitor for operating rooms (OR). 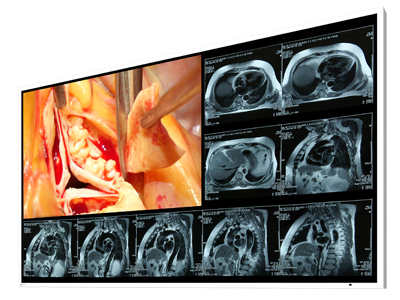 The CuratOR LX490W is a Full HD (1920 x 1080), widescreen monitor ideally suited for viewing medical images such as X-ray, CR, MRI, or endoscopy in the OR. The LX490W is the successor model to the LX470W. Compared to its predecessor, the LX490W's screen size has been increased from 47 to 49 inches to improve the overview of images across the larger viewing area. The monitor's side bezels have been reduced by 56% to a mere 13.3 mm. Although the screen size has increased by two inches, EIZO has maintained the same basic physical dimensions to ensure consistency with the installation footprint of the previous model. With its optimized construction, the monitor is also 22% lighter than its predecessor, making handling and installation in the OR more convenient. The fanless, waterproof design and easy-to-clean protective front screen makes the monitor well suited to the frequent cleaning requirements of OR environments. The LX490W has a high brightness LED backlight that can be set to luminance levels up to 700 cd/m2. The backlight is maintained at its calibrated luminance using the integrated stability system to ensure the image remains consistent with medical imaging standards over time. With a contrast ratio of 1300:1 and 178° wide viewing angles, healthcare professionals can rely on the screen's clarity from any perspective. The LX490W retains all of the great features of the LX470W, such as the wide range of input and output signals for interfacing with the most common imaging systems. With its five factory-calibrated gamma modes, the LX490W can be quickly tailored to meet different requirements for brightness and the display of different image types such as DICOM-based X-rays or endoscopic sources with a gamma of 2.2. In addition to the predefined 12-bit look-up tables (LUT), the LX490W offers a user-definable LUT for easy, onsite adaptation to specialized viewing needs. The monitor can also be configured to view multiple source images simultaneously using picture-in-picture (PiP), picture-and-picture (PaP) or picture-over-picture (PoP) functionality. Visitors to Medica 2016 in Düsseldorf, Germany will be able to see the new monitor at the EIZO booth, Hall 10, #H41 from November 14-17. The LX490W will be shipping at the end of 2016. Date of availability varies by country so contact the EIZO group company or distributor in your country for details.